The comets nuclei range from 100 m to 40 km acros. They are composed of rock, dust, water ice and frozen gases such as carbon monoxide and dioxide, methane and ammonia. Because of their low mass, comet nuclei not became spherical ander their own gravity, and thus have irregular shapes. Comets also contain a variety of organic compounds; in addition to the frozen gases, that include methanol, hydrogen cyanide, formaldehyde, ethanol and ethane, also more complex molecules such as long-chain hydrocarbons and amino acids. In 2009, it was confirmed that the amino acid glycine had been found in the comet dust recovered by NASA's Stardust mission. Comets are often popularly described as "dirty snowballs", though recent observations have revealed dry dusty or rocky surfaces, suggesting that the ices are hidden beneath the crust. Comets are something like the permafrost.... 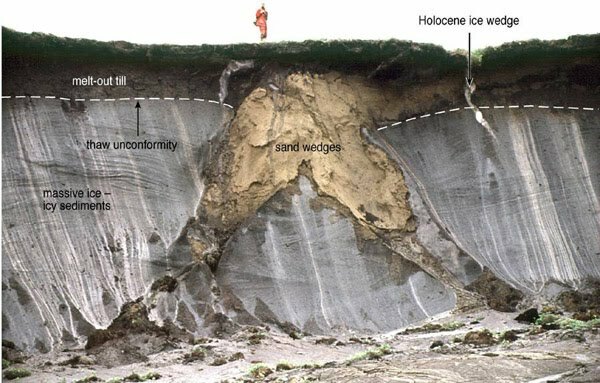 In geology permafrost, or permafrost soil, is soil at or below the freezing point of water (0 °C or 32 °C) for two or more years. Ice is not always present, as may be in the case of nonporous bedrock, but it frequently occurs and it may be in amounts exceeding the potential hydraulic saturation of the ground material. Most permafrost is located in high latitudes. Like permafrost, comets have a crust, a surface layer that protect the frozen gas and water inner the body from solar radiation. 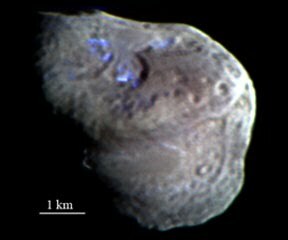 The three small areas of water ice on the surface of Tempel 1 appear in this image, taken (2005) by an instrument aboard NASA’s Deep Impact spacecraft when the research team focused on infrared light emitted from fine dust particles that were ejected from the impact site. According to analysis of the spectra of Tempel 1 on July 4, 2005 reveals the IR signatures of a host of amorphous and crystalline inorganic powders. Included are minerals such as magnesium-rich forsterite and iron-rich fayalite (both in the olivine family); ferrosilite, an iron-rich pyroxene; and nontronite, a smectite clay containing iron, aluminum, and sodium. The spectra also feature telltale signs of other minerals, amorphous carbon, water ice, sulfides, and polyaromatic hydrocarbons. The researchers point out that previous comet studies relied on data collected from material that migrated from the comet surface to the atmosphere surrounding the comet—the coma. But current thinking in the field suggests that a comet's exterior evolves because of the effects of solar radiation and hides pristine solar system material under a surface layer. The present study probes 20 to 30 meters beneath that layer. Comet Hartley 2 is 100 times smaller in volume than the comet Tempel 1. View Hartley 2 NASA´s flyby Deep Impact EPOXI 2010 mission. The Halley comet have been subject to scientific investigation since the 16th century. The 1910 approach was notable for several reasons: it was the first approach of which photographs exist, and the first for which spectctroscopic data were obtained. Furthermore, the comet made a relatively close approach of 0.15AU, making it a spectacular sight. On 18 May the Earth actually passed through the tail of the comet. One of the substances discovered in the tail, by spectroscopic analysis, was the toxic gas cyanogen which chemical compound with the formula CN led astronomer Camille Flammarion to claim that, when Earth passed through the tail, the gas "would impregnate the atmosphere and possibly snuff out all life on the planet." This pronouncement led to panicked buying of gas masks and quack "anti-comet pills" and "anti-comet umbrellas" by the public. In reality, as other astronomers were quick to point out, the gas is so diffuse that the world suffered no ill effects from the passage through the tail. Comets nucleus, made of dirty ice of low density, would escavate only a very shalow crater. A number of physical and chemical consequences of the comet impact are wortly of investigation. It is interest to discover whether cometary molecular species, such as CO2, CO, and HCN, could survive the explosion. The synthesis of new molecular species in the cooling fireball may be of interest, as well as the production of high-temperature species such as CN, HCN, and nitrogen oxides by passage of the shock front through the Earth´s atmosphere must also be considered. Hydrogen cyanide (HCN) is an extremely volatile composition, and it is a commun molecule found on comets. Pure it can in such a way be found in how much gaseous the liquid form, have to its low point of boiling (25,7 °C) and the great volatileness. Bubbled it in water, a solution called hydrocyanic acid is produced, is a chemical composition that contains the cyanide anion (CN−1). The most common are potassium (KCN) and of sodium (NaCN) cyanides. They are extremely poisonous to some beings livings creature. Cyanide ions interfere with iron-containing respiratory enzymes, due to ability of the ion in combining with the iron of the hemoglobine, blocking the reception of the oxygen for the blood, killing the animal by suffocating. Cyanides has a fort smell of bitter almonds, and meets in certain plants, as Manihot, and in seeds of certain fruits (apples, peaches). After the atomic power airblast and ground explosion of billions of meteors, thousands of depressions could be formed on the ground. These new structures, water filled after the subsequents rains, forming lagoons where none existed before, they should be filled of mortal cyanits acid poisoned water, among other possible toxic compounds. The soil can also be contaminated by toxic compounds.